9 world cup debuts for australia... that has to be imposing for the players!!!! 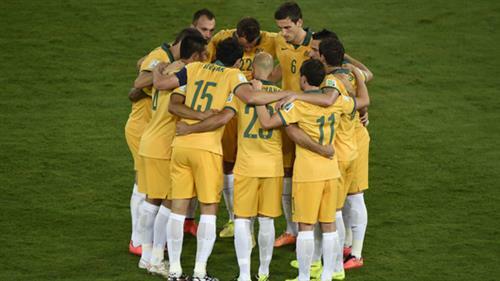 The Socceroos are all in gold, while Chile line up in a red top, blue shorts and blue socks. Don't get me wrong Tom, I love it. It is the only way I can keep up with BPL during the season and the WC. We'll be here throughout the tournament, Cory - hope you will be too! Based on reputation Chile should win the match, but Australia will be motivated for a win. Tim Cahill and Gary Medel get involved in an early scrap here - it's going to be a physical battle tonight. Our only hope is the refs mistaking us for Brazil. Bravo claims a cross well for Chile there - he'll be happy with that. No doubt chile will win this game , they have Alexis Sanchez , Arturo Vidal and Mauricio Isla which can be a big threat to Australian defenders. .
Mark Bresciano fouls Mauricio Isla here - expect lots of that. It's fine being up late when you lot are here to keep me company, bristolian - in a purely platonic way, that is. Chile will win 4 - 1 vs Australia. I feel you Cory. Running a coffee shop and paying attention to Boot Room is a difficult task. i would say spain pushed too high up, and with hollands fast counter attacking pace, it actually hurt them more. if you watched robbens blistering run to the goal, you would see the last defender was very close to the middle line, and still couldnt really stop him, not forgetting the other oranje on the left that was pulling the second defender away. Go Socceroos (I'm neutral, by the way). Eight minutes gone in Cuiaba and Chile have settled confidently, but Australia are matching them for physicality. Chile leaving soooo much space. Australia can surprise chile , anything can happen . Medel handles and gives away a free kick - the Australians may want a yellow, but there's nothing doing from the official. The Barcelona forward opens the scoring and it's all too easy for La Roja -- Charles Aránguiz dribbles up to the goal and draws out Maty Ryan before crossing, and the ball eventually falls to Alexis Sanchez to blast in off the keeper from six yards out. Chile is 8-0-3 at World Cup when scoring first. Im loving this world cup with all these goals ! What a pass by Vidal ! This is too easy -- Vidal picks a lovely pass and Jorge Valdivia smashes in to the top corner from 20 yards out. Two in two minutes for La Roja, and it's a disaster for the Socceroos. Alexis didn't create the play he was set up but he still scored , proud of the FC Barcelona player. Netherlands' counter-attacking will destroy this type of play from Chile. If Spain got killed for playing its D too high, the Dutch will run rampant against Chile's high backline. Corner for Chile - this is getting bad for the Aussies. Man he got a lot of pace on that ball for just a poke. Chile starting XI: Bravo, Mena, Isla, Sanchez, Vidal, Valdivia, Vargas, Medel, Jara, Aranguiz, Diaz. Australia starting XI: Ryan, Franjic, Davidson, Cahill, Milligan, Spiranovic, Leckie, Oar, Jedinak, Wilkinson, Bresciano.